A U.S.-based team of researchers featuring MIPT scientists has assembled a nanoscale biological structure capable of producing hydrogen from water using light. They inserted a photosensitive protein into nanodiscs — circular fragments of cell membrane composed of a lipid bilayer — and enhanced the resultant structure with particles of titanium dioxide, a photocatalyst. The research findings were published in the journal ACS Nano. Modern technology allows researchers to synthesize life artificially, with no biological cells involved. Thus, functional membrane proteins can be obtained by using various media that mimic the proteins' natural environment. 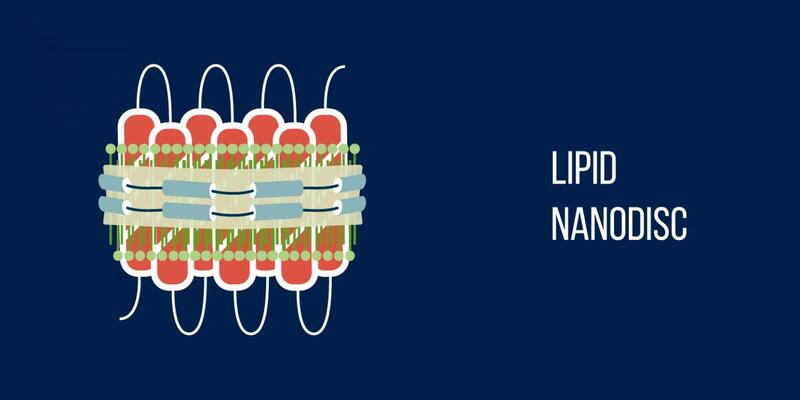 Among such media available to scientists are nanodiscs — membrane fragments made up of phospholipids and encircled by two protein molecules in a double belt formation. The size of a nanodisc depends on the length of the two beltlike proteins. As a membrane protein, bacteriorhodopsin belongs in a cell membrane and so is quite at home in a nanodisc, which is an amazing structure designed to preserve natural protein structure. Nanodiscs have been used to study membrane protein structures, develop medical agents, and are now being repurposed for photocatalysis. Assisted by MIPT material scientists, the researchers obtained nanodiscs 10 nanometers in diameter, with bacteriorhodopsin nested within. The team dissolved nanodiscs in water, along with titanium dioxide particles. They even added some platinum for good measure — and not just because it sounds great, but because it makes photocatalysis more effective. Left overnight in that mixture, the nanodiscs stuck to the catalytic particles. Bacteriorhodopsin — the proton pump — doubled up as an antenna. It captured light and transferred its energy to titanium dioxide, increasing its sensitivity to light. In addition, bacteriorhodopsin performed its usual function of translocating protons, which were reduced yielding hydrogen thanks to the presence of the platinum catalyst. Because it takes electrons to reduce protons, the researchers added some methanol into the solution to serve as an electron donor. The mixture was exposed to green and white light, with some 74 times more hydrogen produced in the latter case. On average, the emission of hydrogen was maintained at a nearly constant rate for at least 2 to 3 hours.